Books on your Kindle Paperwhite are organized into chapters, which are read in a linear fashion. Periodicals such as newspapers and magazines, on the other hand, usually contain a number of articles grouped by section. Readers often choose to skip around among sections and articles. Fortunately, the Kindle Paperwhite has several special features to enhance the experience of reading periodicals. 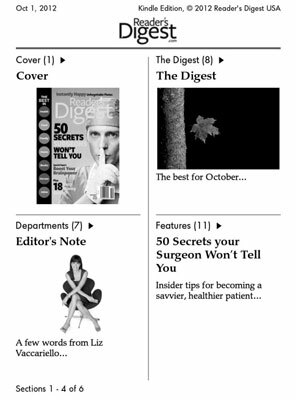 From the Home screen, tap the title of the periodical you want to read. By default, it opens in a view that displays different sections, with the number of articles in each section. Tap the top of the screen to display the toolbar. The Store icon you see while reading a book has been replaced by two icons that enable you to switch between the default Cover view and the Section view. You can think of these views as similar to Cover view and List view on the Home screen. The left side of the screen lists the various sections and the right side lists the articles in the specific section. 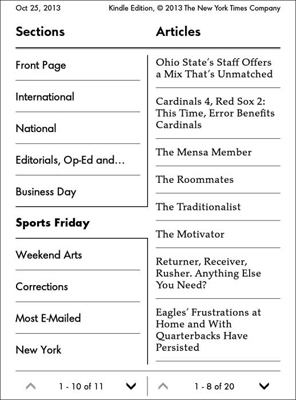 The bottom left shows the total number of sections and the bottom right displays the total number of articles. You can navigate through the pages of sections and articles by using the arrows at the bottom of the screen or by simply swiping the screen. You can move forward in a periodical in a linear fashion by tapping the title of the next article at the bottom of the screen. The percentage that appears to the left of this navigation bar shows how far in the article you’ve read. Shop Kindle Store: Go to the Kindle Store to browse and find periodicals. Sync to Furthest Page Read: If you (or others on your Amazon account) have viewed the periodical on another device, you can adjust your location to the furthest page read. View Notes & Marks: Display the highlighted sections, notes, and bookmarks for the current periodical. Share: Share articles of interest on Facebook and Twitter. Settings: Toggle Airplane mode on and off and access options for Wi-Fi networks, registration, reading, parental controls, time, language, and more. In addition, the secondary toolbar sports a Clip This Article option. Tap that option to save an article to your my Clippings file. My Clippings is listed on your Home screen, just like a book or other content. If it isn’t at the top of the list, swipe through the pages — it is probably at the end.